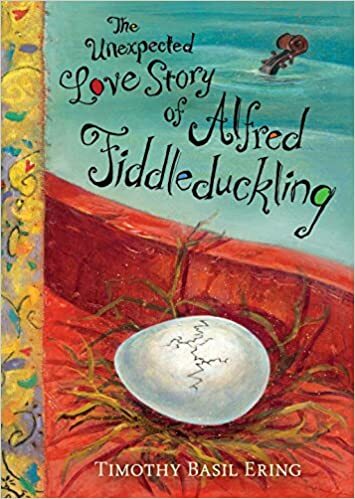 Summary: Captain Alfred is sailing home to his wife with new ducks for their farm and a egg that is ready to hatch stored in his fiddle case. They’re almost home when they sail straight into a huge storm that washes the egg overboard. The duckling hatches, and the first thing he sees is the captain’s fiddle bobbing in the water nearby. Grabbing hold, he realizes that the fiddle makes beautiful sounds, and plays until they are both washed ashore near the captain’s house. His dog hears the fiddle music, and discovers the duckling, and the two become fast friends. They try to find their way home through the fog, and once again the music comes to the rescue. The captain’s wife hears it, and is overjoyed to find her dog, as well as a new friend. 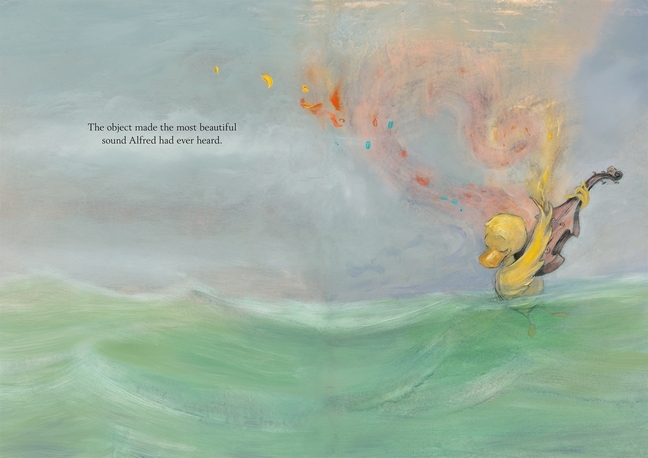 The duckling keeps playing, and the final page shows the captain floating on a raft, paddled by ducks, following the sound of the music. 48 pages; ages 4-8. Pros: A whale of a tale, illustrated with beautiful colors that show the color of the music in the gray stormy seascape. Cons: That is one ugly dog.